So I am associate member of of ACWU – the Associated Clay Workers Union. A wonderful collective of non-functional ceramic artists who are come together to make joint site specific projects in unusual settings. As a Ceramic student I am still on the fringe of this budding organisation, but I was delighted that they have included me in a project they are organising with Transport for London at London Bridge. The wonderful Alison Cooke and Diane Eagles approached the contractors responsible for the renovations of London Bridge Station and asked if we might have some clay dug from under the station, to use to make site specific work, based on the history of this area of London. They agreed and screwed down 30m into the earth below the station, with one of those enormous pilling drivers and brought us up some virgin clay that is 50 million years old! 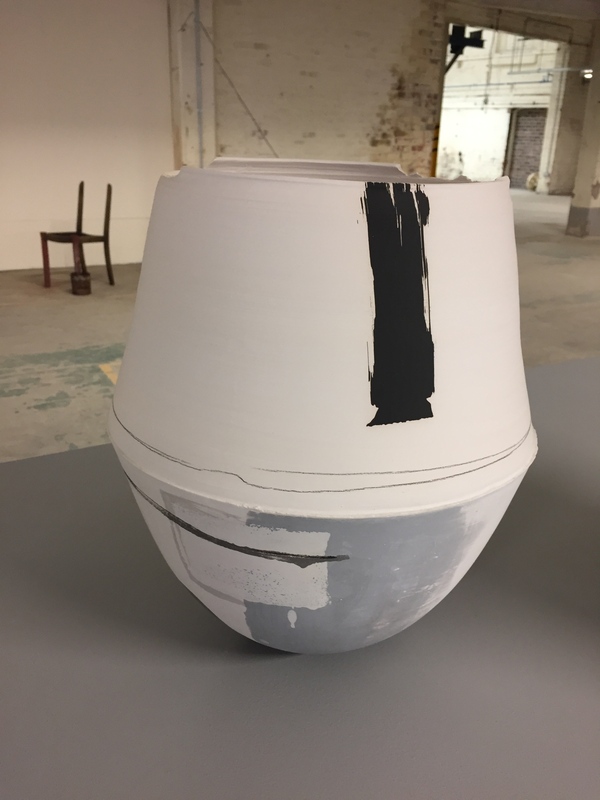 A successful grant application to London Potters Association brought ACWU £500 with which to hire a van to collect the clay, and buy a box and sieve for all the ACWU artists to enable them to transport and process the clay. Even after seiving and drying on a bat in the spring sunshine, the clay is very sticky, and quite tricky to work with. Soaking the rock hard clay in water for a few weeks made it maliable enough to sieve and make ready for modelling. The archaeological dig that took place before building work at London Bridge began, revealed a rich history dating back to Roman Times. In fact an oil lamp in the shape of a foot was found under the construction site. Which is my starting point. I am thinking of giving my foot nail polish, with a nod to gender issues we face today. I will keep you posted as to how the project progresses. ACWU is working to exhibit the work in London Bridge Sation at some point late summer or early autumn. I will keep you updated as to when this will take place! Well last Thursday was a Red Letter Day: the first time my ceramic work has been included in a public exhibition (not at college). The lovely folk at the Pangolin London Gallery on the ground floor of Kings Place included 10 pieces from the First Year BA Ceramic Design students in their Sculpture in the Garden Show, mine being one of them. The project on display are a series of huge ceramic seed pods hand coiled based on electron microscopic photos of various seeds taken by the wonderful CSM tutor Rob Kessler. Here is how my work looks in the Pangolin gallery windows. I am particularly pleased that I managed to get the spikes on the underside of this piece. 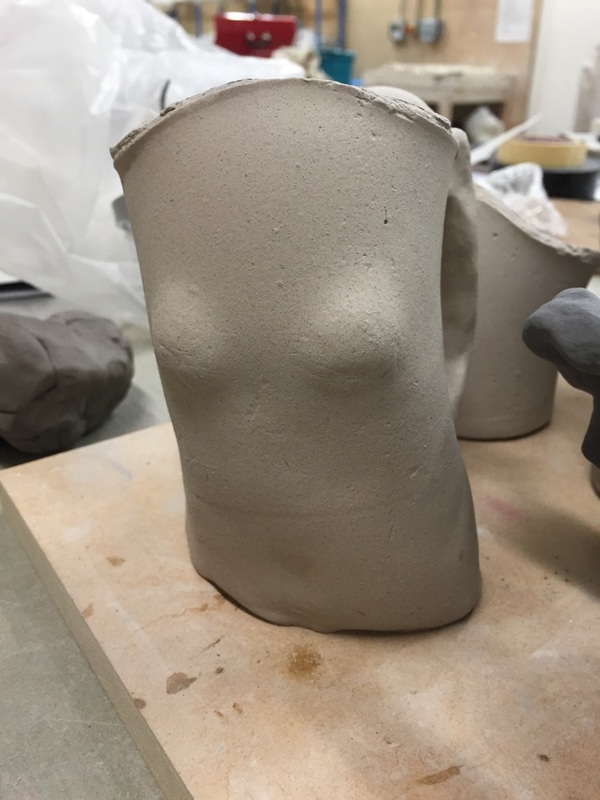 It’s all about the drying of the clay. Also many thanks to Campbell from the CSM jewellery dept who so kindly laser-soldered three special tools for me to make the zig-zag markings you can just about see in the image above. 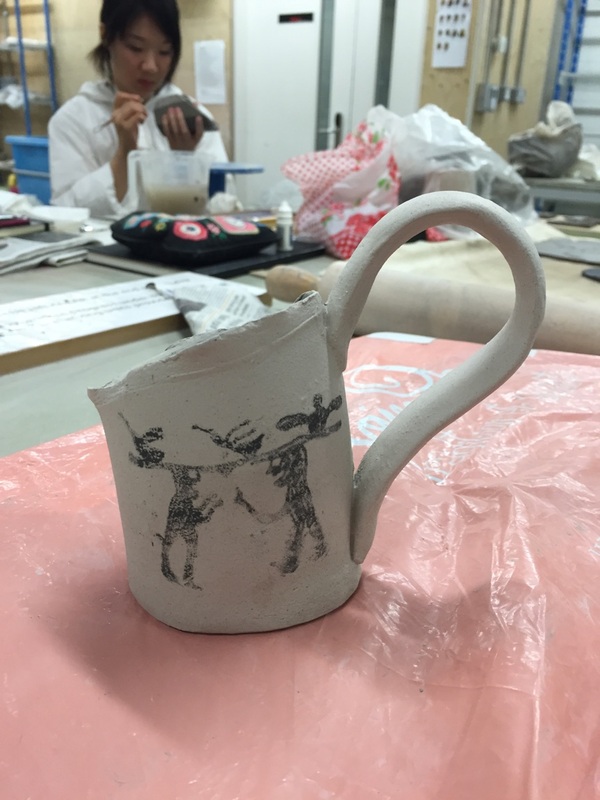 So glad my first slip cast mugs have survived the first firing. 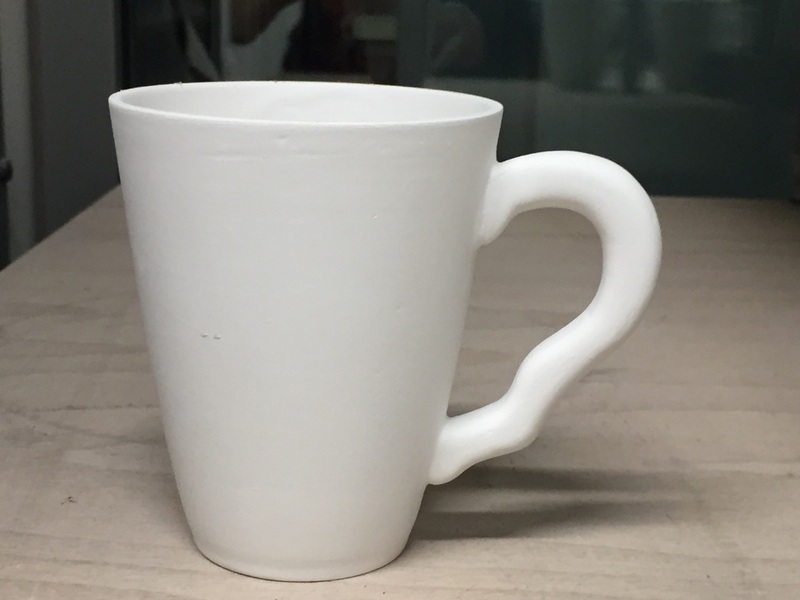 The handle is supposed to suggest an ear shape. I’m thinking about doing some kind of eye or face screen-print decoration on one of them in the coming weeks. 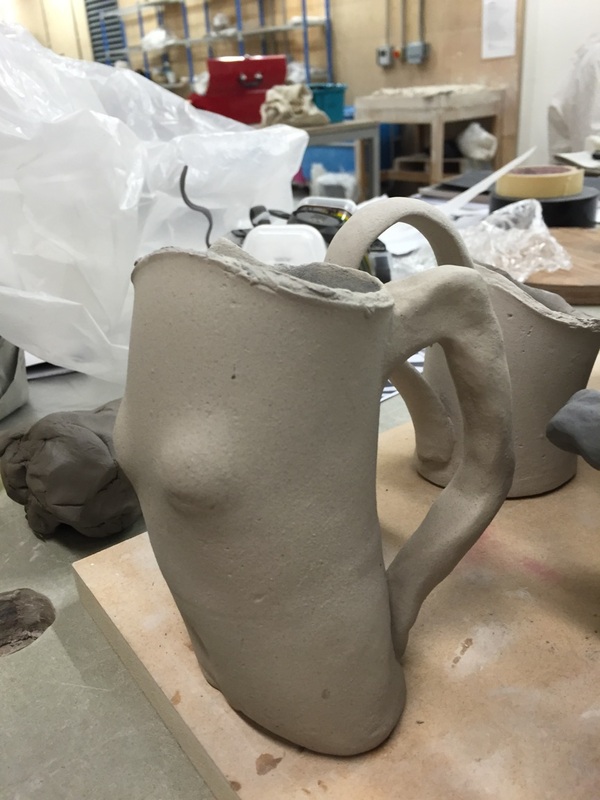 I have also been working on some hand-built mugs that started life as extruded tubes of clay. 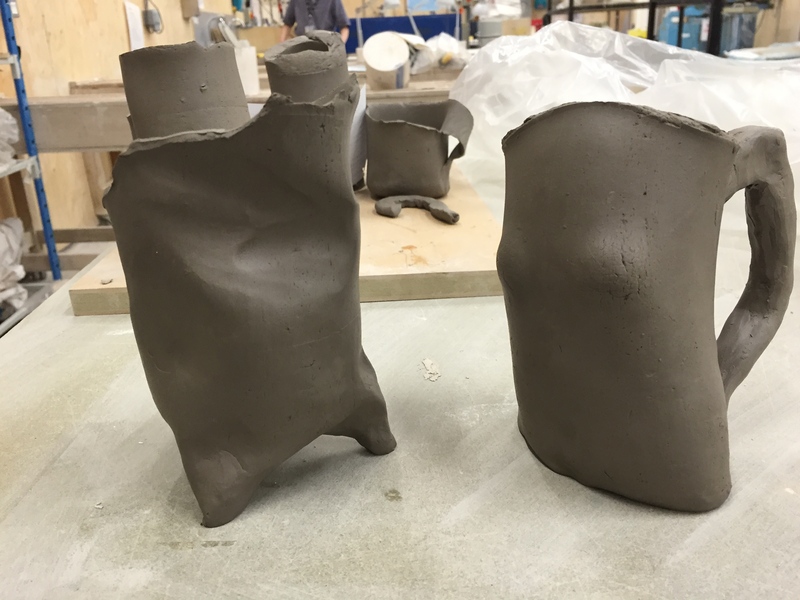 Most are non-functional, Having left the lip as torn clay as it came out of the extruder. I liked the effect that the torn clay makes. Next up: glazing. We will be given an induction into glaze mixing and applying tomorrow. Can’t wait. Well it has been a roaring 2 weeks since my first blog post. 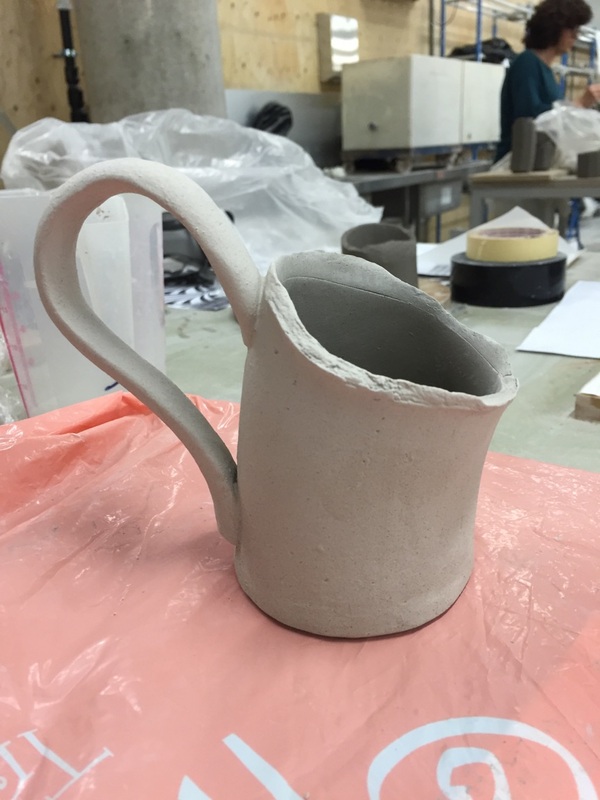 I have been to the British Ceramics Biennial held in the disused Spode factory in Stoke on Trent, I have created plaster moulds for a mug and handle then slip caste them, six times. I have been to Expo in Milan for the day with the family, not to mention today’s blissful day experimenting in the studio extruding clay and playing with the results. Phew! The visit to Stoke was inspiring and dispiriting by turns. Inside the exhibition were examples of the latest work by established artists and recent arts school graduates. Fingers crossed I will be exhibiting there in 3 years time! I was particularly impressed by the Clay Cargo exhibition put on by my CSM tutor, Duncan Hooson. The depth of the thinking and the amount of energy and commitment he and his co-conspirator Julia Rowntree of Claygound Collective bring to keep the making with clay alive by introducing it to new people was awe inspiring. A barge fitted out as a ceramic studio, navigating the canal waterways of Britain, (that were originally built by Josiah Wedgwood et al, as a means of connecting the potteries to the ports of Britain – who knew?). Then staging public events inviting the uninitiated to make a collective sculpture for the day. Rather like the one we students made on our first day of term. 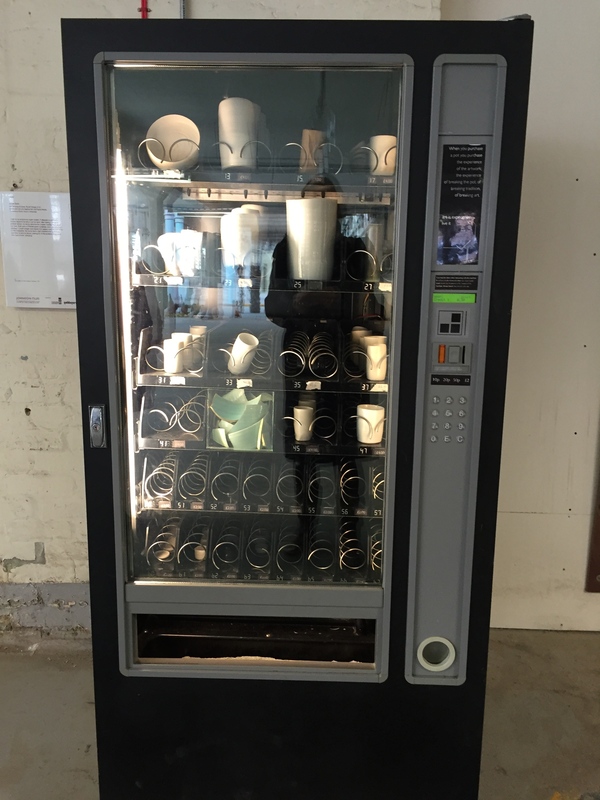 My favourite student work on show at the exhibition included James Duck’s vending machine with porcelain vessels in. For a mere £4 you could purchase an original celadon pot from the machine, have it roll forward and smash on a rock placed in the base of the vending machine. 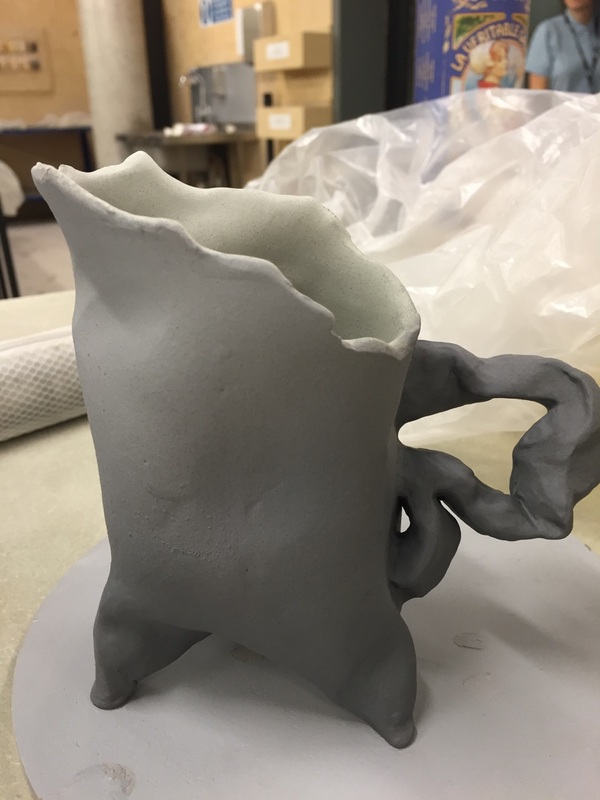 Ceramics are breakable, and on one level disposable after all! How long do we ever own them for? I bought a piece and it only chipped on the edge, and it now sits on my desk holding pens. Hannah Tounsend’s thrown and caste pieces were beautiful too. 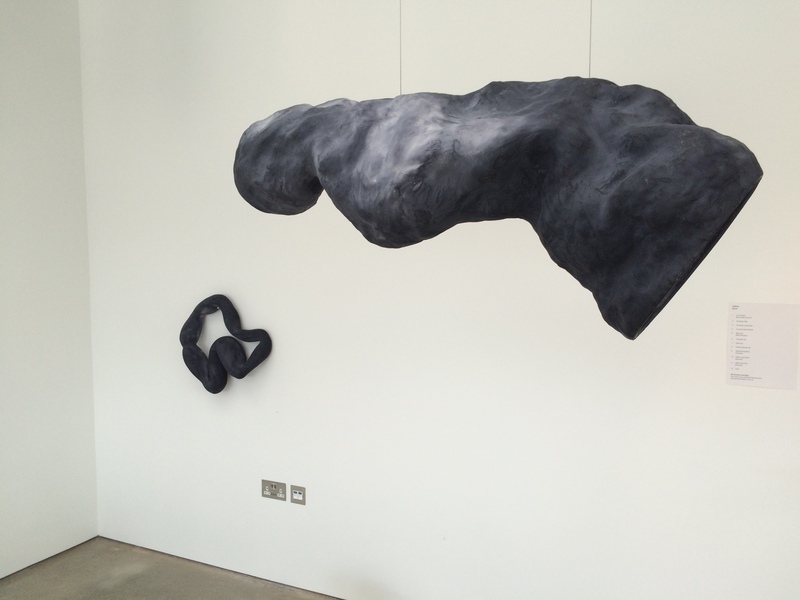 And I was delighted to see Alex Simpson, my favorite from the RCA’s summer show. But then wandering around this factory site, that has been derelict since 2008 when the loss adjusters came in, was depressing. 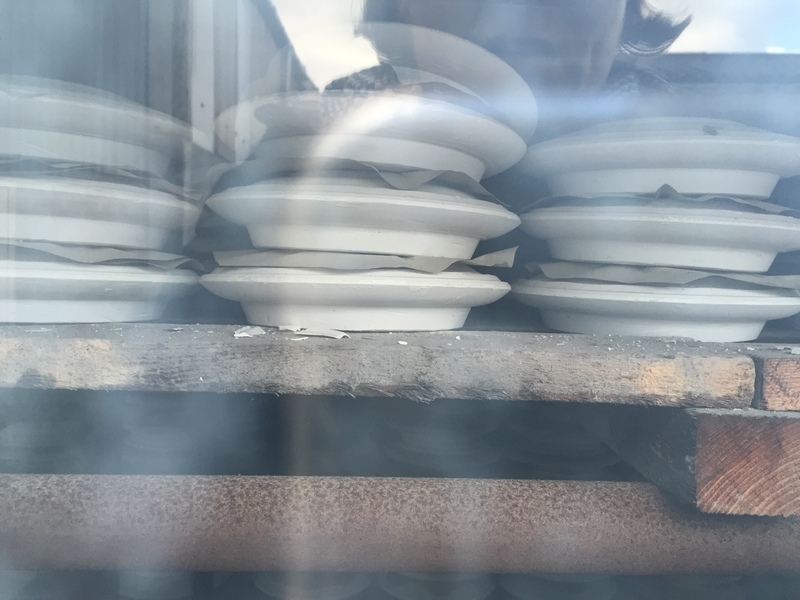 Spode plate moulds were visible through cobweb windows. Empty warehouses with up turned chairs. Luckily, we came across a maverick in a white jump suit, who was busy painting the walls of an empty unit near the edge of the site. He was setting up a new pottery studio, a professional ceramic painter, who had worked at Spode and currently at Emma Bridgewater, but who was going it alone. 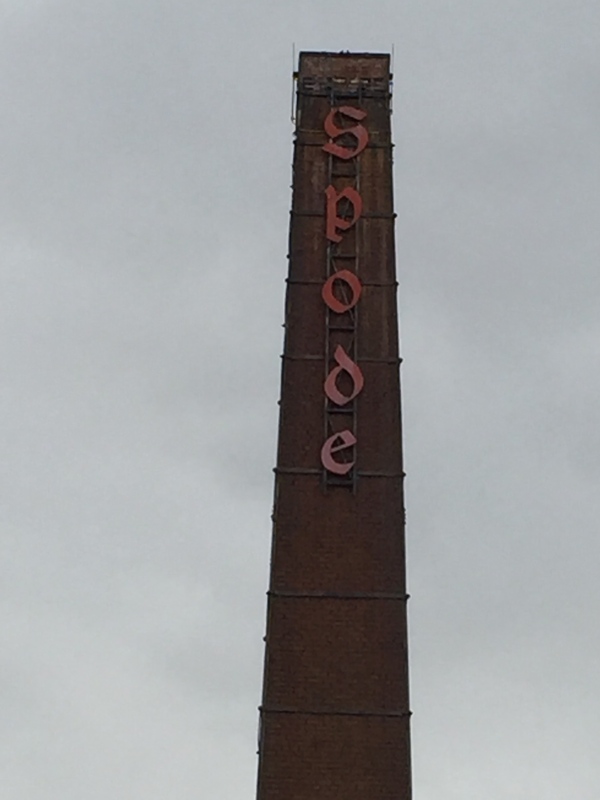 Then we discovered the Spode Visitor Centre and were heartened to meet former ceramic factory workers who were keeping the spirit alive, and who had good news about funds having been secured to save the massive Spode archive. My family’s experience of seeing the city of Detroit hanging on by its finger nails over the last 20 years, and now getting on an even keel, with the threatened bankruptcy behind it and groovy arty types moving into the derelict warehouses downtown, makes me hope that Stoke on Trent and the heritage of Spode will secure a similar renaissance … Fingers Crossed that Stoke City’s victory over Chelsea FC last night is a good omen! 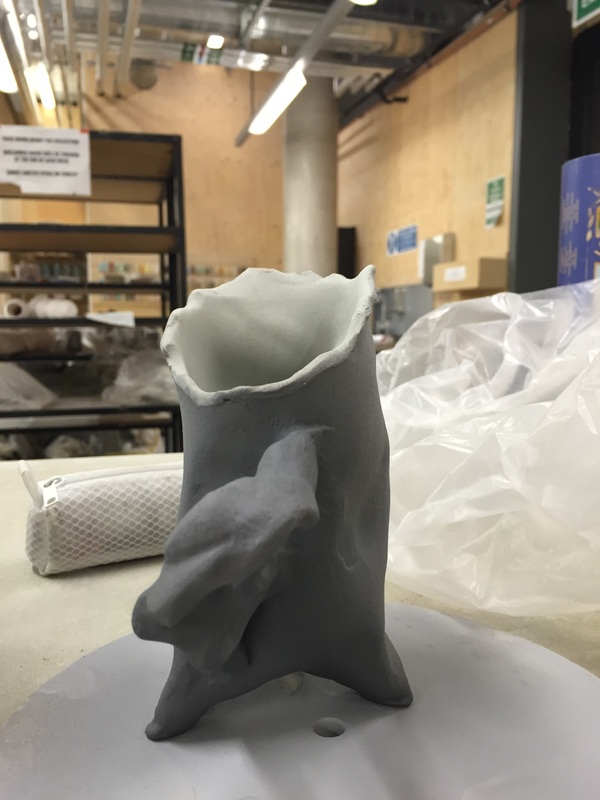 PS Here is what I have been up to in the studio today playing with extruded clay tubes to make drinking vessels. I couldn’t resist the pull of the human form!